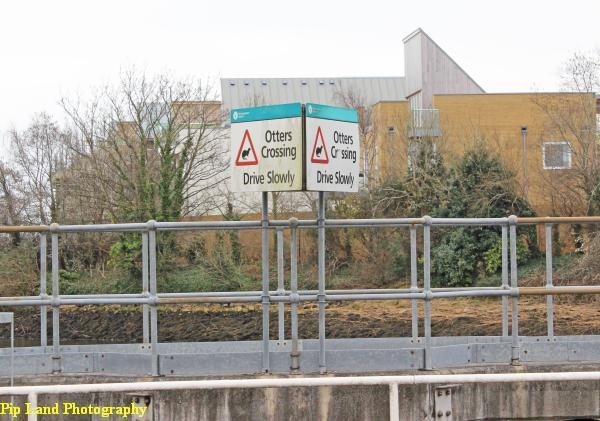 Above: One of our favourite road signs: this one is on the bridge over the Lymington River. Our trip to South Dorset included visits to Buckler’s Hard, Beaulieu and the National Motor Museum, the Haynes International Motor Museum, Poole, Sandbanks, Christchurch Priory (with its Misericords), Mudeford Quay, and Highcliffe. As we drove “down South” on March 13 it just got warmer and warmer, and the cars got bigger and bigger. At Cherwell Valley Services on the M40 people were sitting outside in the sun; and as we approached Bournemouth we were passed by Porsches, a Ferrari and some very expensive Mercedes – a good pointer to the way the area has developed. No posh hotel for us but that wasn’t a problem as, once again, we enjoyed the comfort of a spacious room at a Premier Inn. This time, by searching carefully and booking well ahead, I found an excellent deal at Christchurch East. The location was ideal, and we were well cared for at breakfast time at the Somerford Beefeater restaurant next door. With my food intolerances I especially appreciated the provision of the allergies book for cows’ milk products, and that the staff were willing to check ingredient lists for potato starch or tomatoes. 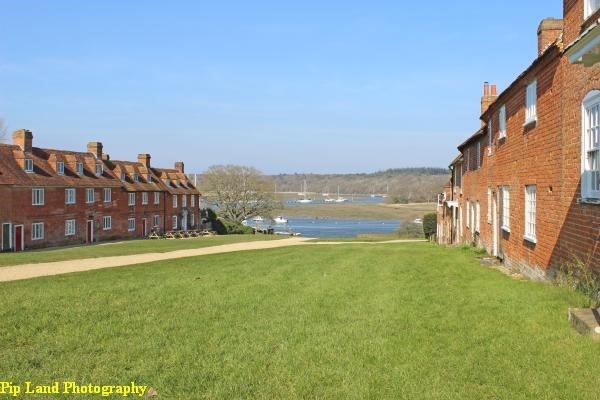 David had two priorities on this visit: to see his cousins, and to visit Buckler’s Hard. So we started well the following day by collecting his cousin, Christine, and heading through the southern end of the New Forest to reach Buckler’s Hard. Some wild ponies did put in an appearance for us but my main memory will be of free-roaming cows that were trying to push their way through garden hedges leaving their well-rounded buttocks protruding into the road. At Buckler’s Hard we began, of course, with morning coffee at the Captain’s Cabin Tea Rooms, again sitting outside in the warm sunshine. I was keen to see the hamlet but Christine and David wisely took their time to study the detailed and informative displays in the Maritime Museum. This has recently been re-designed and provides an excellent guide to how the hamlet has developed since the early 18th century when it was called Montagu Town because the second Duke of Montagu wanted a free port for trade with the West Indies. That dream was short-lived, however, and only seven houses were built. Instead the good facilities for building and launching ships attracted Henry Adam to move there in the mid-18th century. Buckler’s Hard flourished, more houses were built, including Adam’s own, and longer launch ways were constructed large enough for 64 and 74 gun war ships. Adams went on to build Admiral Nelson’s favourite ship, HMS Agamemnon (which took part in the Battle of Trafalgar in 1805) as well as HMS Euryalus, HMS Swiftsure, and HMS Indefatigable. The museum doesn’t just commemorate men like Henry Adam but also the lives of ordinary labourers with excellent reproductions of their cottages. There’s lots more to see, including a celebration of Sir Francis Chichester’s solo world voyage and the sad tale of the sinking of the SS Persia by a German U-Boat during World War 1. The 2nd Baron Montagu of Beaulieu, John Douglas-Scott-Montagu survived, but not his secretary and mistress, Eleanor Thornton, who was the inspiration for the famous Rolls Royce mascot The Spirit of Ecstasy. As there was so much to see and read I was thankful that chairs had been provided so that the weary could rest during their journey through this museum. At last, we were ready to visit Buckler’s Hard for ourselves. It was lovely and warm walking past a high wall but then we turned the corner towards the Beaulieu River and the cold wind hit us. It was time to remember that it was still March. Even so, we did appreciate the attractive 18th century brick houses 24 of which are grade II listed. Some were large enough to accommodate well-to-do craftsmen like the shipwrights, and others were much smaller and lowlier. A few have been turned into display cottages to illustrate how the inhabitants lived 300 years ago. The building that most fascinated us was the small cottage which had been converted into first a school and then into St Mary’s Chapel. 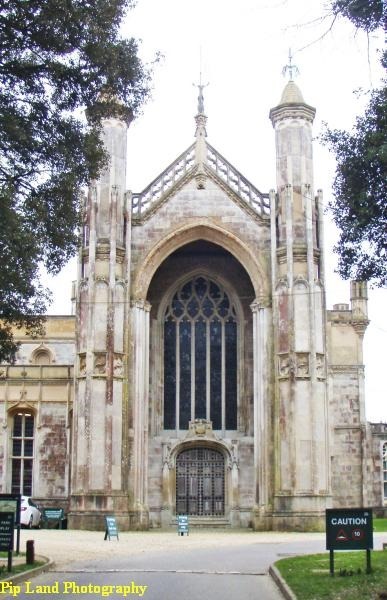 Still owned by the Montagu family of Beaulieu, It has the warm atmosphere of a beloved private chapel which is also regularly used for worship services. 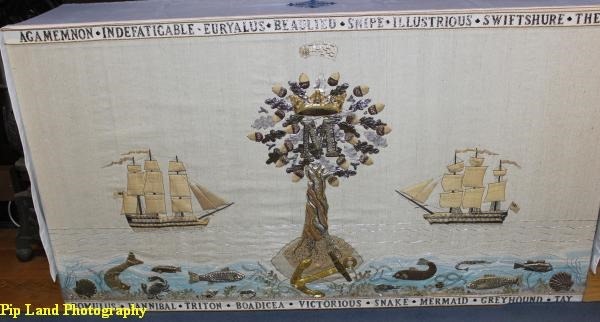 The embroidered altar cloth with the names of ships built at Buckler’s Hard and later lost at sea (below), and the kneelers especially fascinated me. David was keen to visit the “hard” itself – the slope into the river which had been converted for hauling boats out of the water and, of course, for launching wooden warships. Afterwards, we enjoyed a drink in the the house that Adam built for himself and which is now the Master Builder’s House Hotel. Christine was great company and we were sad to say goodbye to her later. That evening we ate at the Somerford Beefeater. We couldn’t fault the service provided by the staff but for David, who is a vegetarian, and for me, with my food intolerances, there wasn’t much of a choice. The next day we headed for Beaulieu and as we waited in the queue to pay for admission we realised that if we had started there we could have got a discount on our tickets for Buckler’s Hard. But then Christine would not have been with us. Yet again the sun was shining and the first thing I noticed was the lovely array of primroses. Our first stop, of course, was the Brabazon restaurant for coffee. 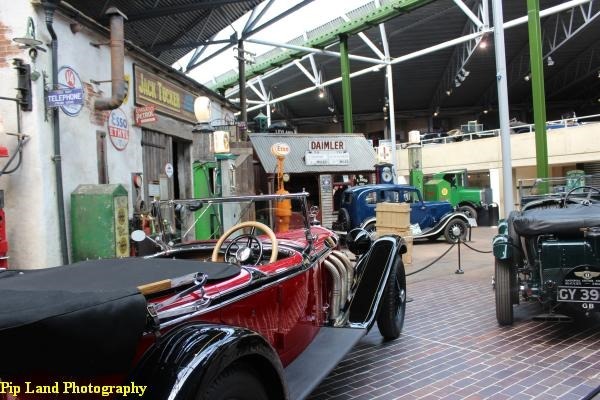 Then it was time for David’s indulgence – a long walk around the National Motor Museum with a collection ranging from the earliest motor carriages to classic family saloons and motorbikes. I was impressed by the attention to detail and the “background” exhibits including the old garage complete with junk heap. 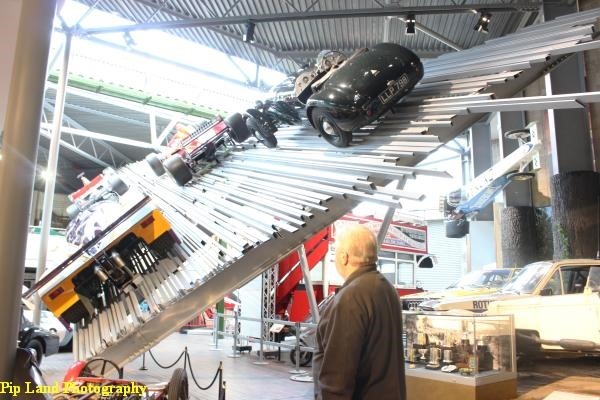 But David was not sure the museum was one of the most comprehensive collections of vehicles in the world, particularly pointing out the lack of popular cars from the 1950s and the 1960s. Below: David beside the display of Formula 1 cars and the garage. The museum is very informative about the early years of motoring and there are many very enjoyable displays including the Shell Collection of Motoring Art. So there was plenty to keep us thoroughly engrossed for almost two hours. Then it was time to return to the Brabazon where we had an excellent choice of food. Lorraine cheerfully helped me to find something I could eat and I especially enjoyed the cooked beetroot with celeriac. We decided to have full meals instead of snacks as the food was so good. Our objective in the afternoon was the the Secret Army Exhibition. This was fascinating, especially the personal stories of some of the men and women who trained as SOE (Special Operations Executive) agents there during World War Two. Below: Looking towards the Palace House. The small building in front of it with the clock tower houses the Secret Army Exhibition. Afterwards David took a ride on the little “bus” while I enjoyed a walk through the gardens back to the Brabazon restaurant. We decided that we had seen enough that day and would return later in the week as that was permissible with the tickets we had bought. David wanted to see if the Haynes International Motor Museum had a more complete exhibition of cars than at Beaulieu so, on Day Three, we headed north west. The journey took longer than expected partly due to David’s navigator (me!) giving him wrong directions. We did manage to get there in time for lunch and the restaurant staff made me a lovely ham sandwich with salad cream instead of buttery spread. David was very impressed by this museum. I have to admit I was not so interested in looking at so many cars but did find a new hobby – “collecting” car mascots and any other interesting features. The mascots included, of course, The Spirit of Ecstasy, but I did like that on the 1915 Ford Model T. Click on the photograph of it below to see more mascots. It was such a gorgeous sunny day when we visited Poole that some people were wearing just T-shirts and shorts. Many were enjoying a stroll along the waterfront, but it was not as crowded as it will be during the summer. We explored what was left of the old town and then popped into Poole museum. It was interesting to read all about the early history of the town and its importance as a site for invasions and the incursions of pirates in days gone by. There’s a lot of information about ships and ship buildings, as well as the remains of an ancient log boat. I also wanted to see Sandbanks so David found somewhere to park and take a rest, overlooking Poole harbour, while I headed for the beach (above). It was a delight to see groups of young mothers gathering there to chat while their young children played in the sand. At least those on more limited incomes can still enjoy the beach but it was so obvious that Sandbanks has become a millionaire’s playground. This peninsula of just half a square mile has been described as the fourth most expensive area in the world to live. Properties are bought and demolished so that multi-million homes can be built. Back at Christchurch we ended up going round in circles trying to find the way to the Quay and Museum because, when we got to the High Street, there wasn’t sufficient signage. Eventually we gave up and headed for the Barrack Road retail centre for coffee. To our delight we both managed to find something to eat at Subway and took our well-filled sandwiches back to our hotel room. This time we planned to visit the Palace House, the Domus and Beaulieu parish church but there was a private function at the latter two. The Domus and the parish church (left) were among the few buildings to survive the destruction of Beaulieu Abbey following the Dissolution in 1538. I was disappointed as I had been looking forward to seeing the embroidered wall hangings in the Domus. These were created by Belinda, Lady Montague and tell the story of the Abbey from its foundation in 1204 until the Dissolution. Instead all we could see was the medieval stonework but that had its own special beauty. The Palace House was created out of what had been the Great Gatehouse of the Abbey. 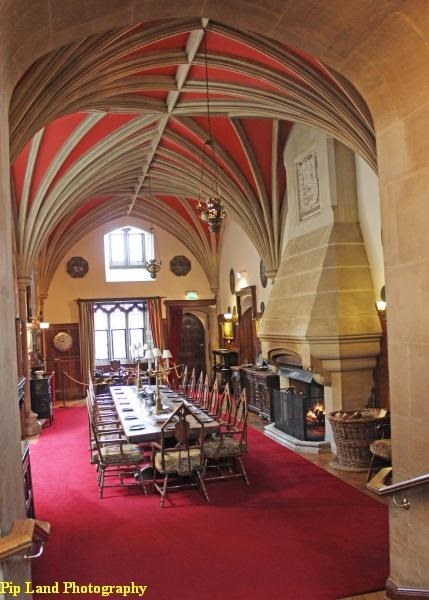 A log fire in the dining room (below right) made it feel very cosy and the homely feeling was reinforced by the Montagu family’s own memorabilia which had not been updated since the death of Edward, 3rd Baron Montagu of Beaulieu in August 2015. In 1952 he created a display of cars at the Palace House as a tribute to his father who, he said, was one of Britain’s motoring pioneers. When that display outgrew the front room the museum was built for it. That evening we had a memorable and happy family evening with cousin John, his wife Debbie and two of their sons. A restful morning followed by a visit to the workhouse. Or rather, a building which was once a workhouse and has been transformed into the Red House Museum. This not only had displays illustrating the archaeology of the area and equipment from bygone times (“oh – do you remember using that?”) but also provided insights into the lives of those who were incarcerated in the workhouse in the 19th century. Later we parked at the quay at the confluence of the Rivers Avon and Stour. It was another sunny, warm day and many families were enjoying The Quomps, the park beside the quay. I walked past Place Mill (a restored Ango-Saxon watermill) and on to Christchurch Priory. My experience of this majestic Norman church was enhanced by the singing of Northcliffe Youth Choir (below). 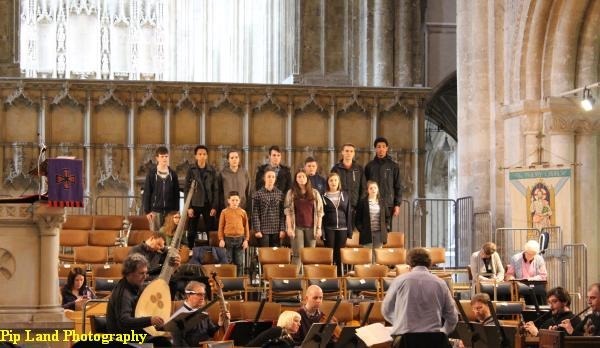 The youngsters were rehearsing for their part in the recital of Monteverdi’s Vespers of 1610 being presented by the Bournemouth Bach Choir the following day. While they sang I walked quietly around the side aisles and explored the fascinating medieval misericords, and peered up at that “miraculous beam”. According to the legend, when the church was being built in the early 12th century that beam had been cut too short. The embarrassed carpenters left it overnight and when they returned next day they found, to their amazement, that it had been fitted into place. They also noticed that a mysterious carpenter who had always eaten alone had disappeared. It was decided that Jesus Christ had intervened – and so the church and the town acquired the name of Christchurch. The medieval carvings on the misericords were fascinating as were the tapestries created for the various local associations including the fishermen of Mudeford. Click on the photograph below to see more. That evening we took Christine to the Toby Carvery Hinton and had an excellent meal. Christine invited us to stay at her bungalow in Mudeford for our last two days in Dorset and on the Sunday morning Debbie took me to Highcliffe. 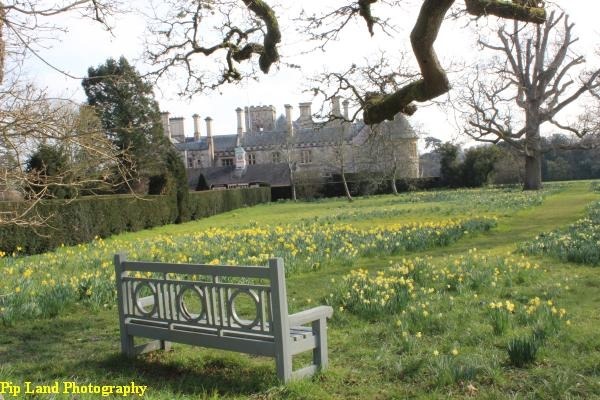 Highcliffe Castle definitely has the Wow factor! I was amazed as she drove in through the gates to see, for the first time, this magnificent example of the Romantic and Picturesque style of architecture. This was the fantasy castle created between 1831 and 1836 by Lord Stuart de Rothesay. By the 1950s it was no longer a family home and two fires in the late 1960s left it derelict. 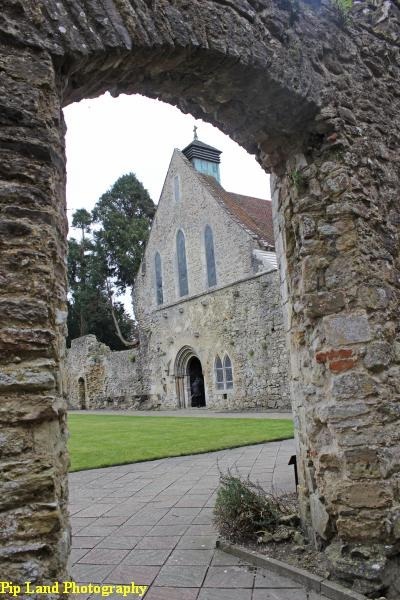 Then Christchurch Borough Council bought it and organised its superb renovation with the help of English Heritage and a grant from the Heritage Lottery Fund. 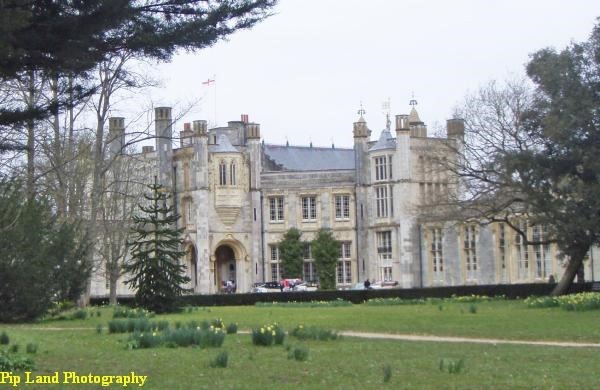 Its not surprising that the castle is now one of the most popular wedding venues in Dorset and Hampshire. Debbie and I walked through the gardens and down the zig-zaging steps to the beach. We weren’t the only ones enjoying an afternoon stroll past Steamer Point Nature Reserve towards Christchurch. In the afternoon I decided to explore Mudeford Quay, where the River Mude flows into Poole Harbour. The Haven House Inn (c.1830) once provided shelter for smugglers but today it relies more on the tourist trade. The Haven Cottages are even older, dating back to the last decade of the 17th century. 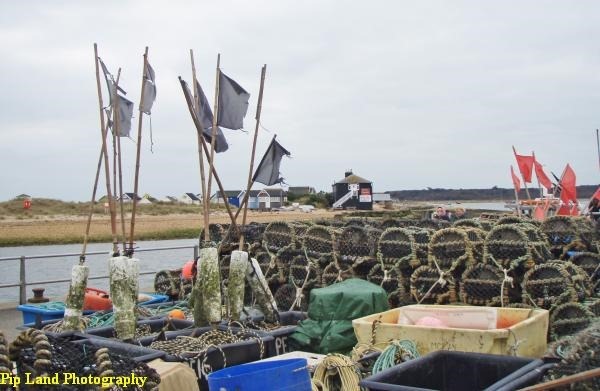 Mudeford began life as a fishing village and there was plenty of evidence of the fishing industry now what with the lobster pots and boats. But Mudeford is also renowned today for having some of the most expensive and luxurious beach huts in the country. The asking price for a one-bedroom hut on Mudeford Sand Spit this year is £185,000. Another hut is up for sale at over £200,000! Above: Expensive beach huts and fishing equipment at Mudeford. That afternoon there were many families enjoying the park area near the Quay and Avon Beach. I stood and gazed along the beach savouring the sound of the waves lapping on the shore before heading back to David. You don’t need a lot of money to enjoy the simple things in life!